The Elachi Return to Threaten the Galaxy! Attention Captains, the Elachi are pouring into the Alpha Quadrant from previously undiscovered Iconian space gates in order to abduct helpless people! With what the Elachi have been doing with their captives, we need every Captain at the ready to help stop their forces. For a limited time only, the Elachi Alert queued event will return to Star Trek Online. From Thursday, March 29th at 8AM PT til Monday, April 2nd at 10AM PT, close these doors to subspace and receive bonus mark rewards. A joint fleet has gathered here to stop them. The fleet consists of science ships that have disabled their weaponry in order to divert all available resources to disabling the gate. We’ll need to protect them from the Elachi until they finish their work. Remember that the science vessels efficiency will drop as they lose crew members to the Elachi. 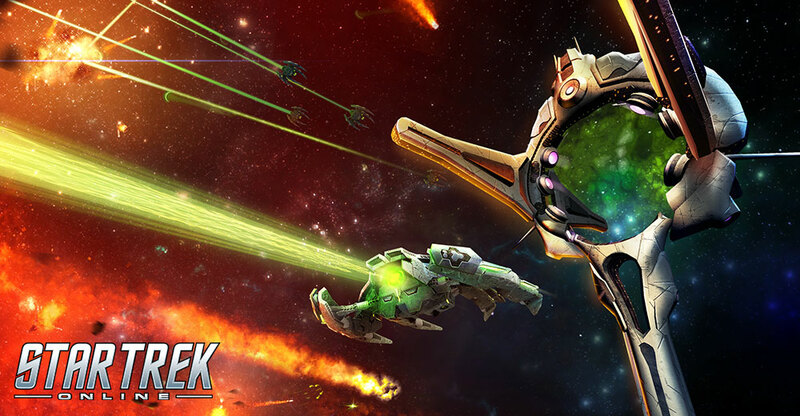 Defend the joint fleet from the Elachi in order to ensure their success. Be careful of Elachi harvesters who'll abduct everyone who can disable the space gate. The Elachi Alert queue will offer a 50% bonus to mark rewards during this event! Quick Captains! You’re needed on the frontlines to stop the invading forces before we lose more Captains!